All of our final undergraduate students are fundraising for their Summer Shows, BA Graphic Design have had a few events to help their fundraising along. The BA Graphic Design third years took over our blog to tell us what they’ve done. 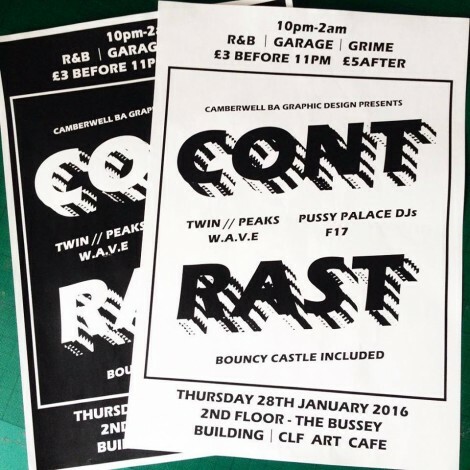 On a thursday night at Bussey Building, Peckham, Camberwell BA Graphic Design third years hosted a garage club night. 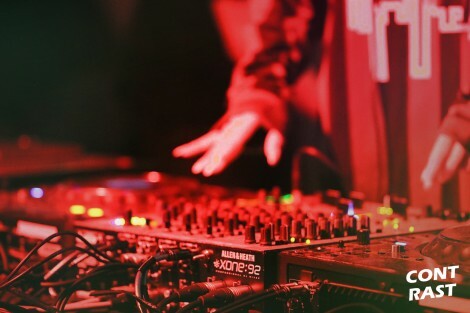 For three months in a row we promoted and organised a night with the amazing support of free performers, and the lovely organisers at Bussey let us come in and take over once a month. The core team was composed of four students on the course; credit goes to Emily Toomer, Karoliina Helosuo, Michael Tsang and Tom Stone. After the first night went surprisingly well, we outsourced two poster designs to Craig McCarthy and Conrad Harshaw, also from Camberwell BA Graphic Design. We made a Facebook event and got people involved with promoting to their friends, we also put posters around various shops in Camberwell and Peckham (for free) and promoted to the other UAL colleges. 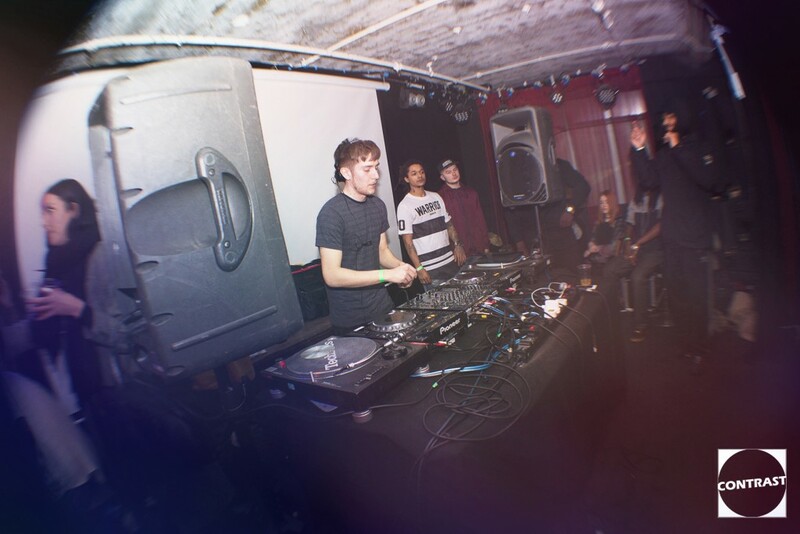 A bouncing castle was also installed into the venue, borrowing from Regression sessions, for the first night. This attracted people to the launch, but also made a loss in terms of how much customers donated to the bucket on the night. The doors were manned every night by the students of 3rd Year BA Graphic Design, who did an amazing job keeping the queue moving and keeping the money organised, only needing two people on the door, changing every other hour. We also held a film night selling popcorn and tickets in Rye Wax, using a projector and sound system already existing in the venue. We hired out the space for £100 deposit in the form of a bar tab, so as long as people bought drinks over that minimum the event would only cost the deposit to hire out the space. Credit goes to Laura Wright, Karoliina Helosuo, Melissa Keen and Tom Stone for organising the event. 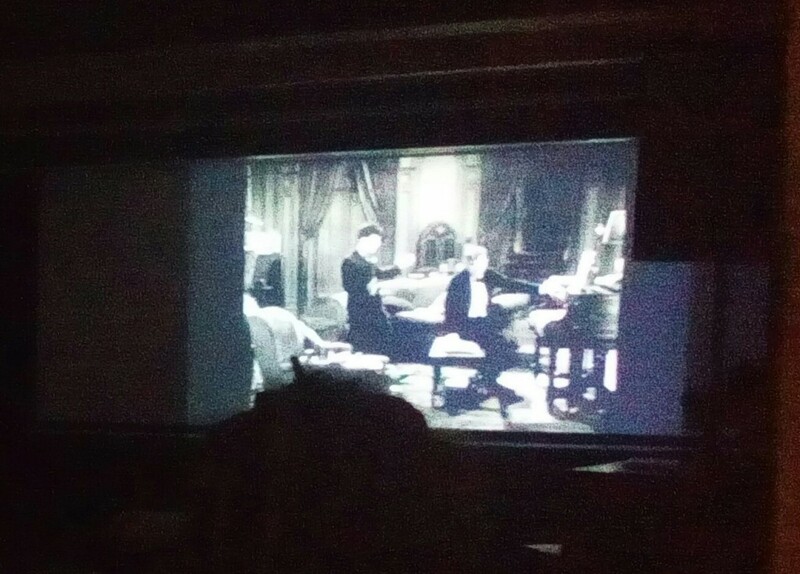 We used silent films, which meant that only normal background music was needed, which still allowed for a bar like atmosphere, until everybody had their eyes glued to the screen watching the hilarity of Charlie Chaplin’s City Lights and The Immigrant! 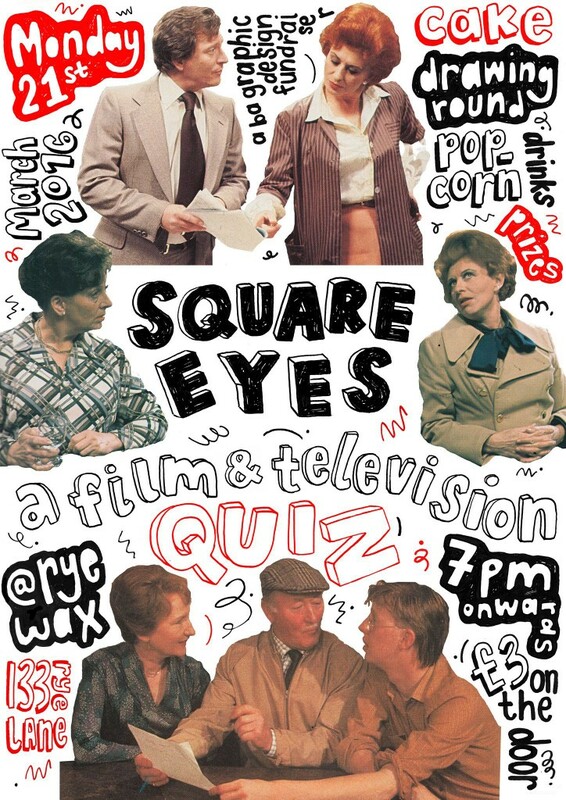 After the film night the idea was developed further into a film quiz night; in the hopes to engage the viewers more, ‘Square Eyes’ was born. From the group’s love of classic films and TV, they brought together a quiz of varying mediums using everything from sound, movie clips, poster clippings to comedic film summaries. Credit goes to Alex Needham and Tom Sutcliffe for being superb hosts and making sure that everybody was having fun, they walked around the tables explaining the rules of each round. 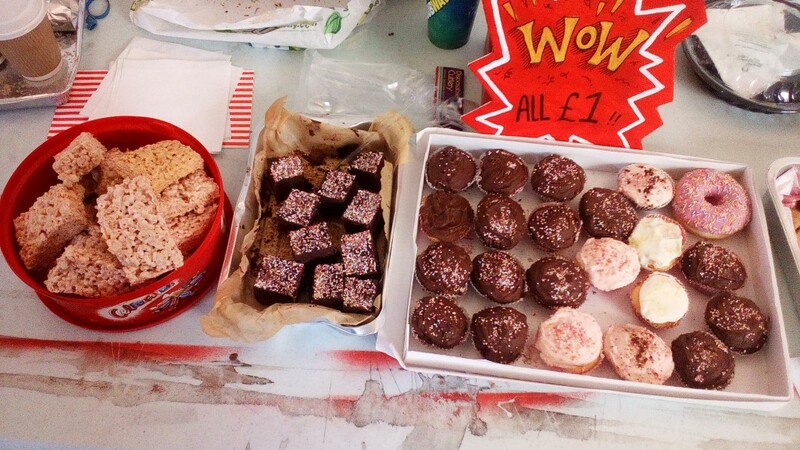 Also attached to the Quiz Night was a bake sale table displaying all sorts of baked goods donated by students of third year BA Graphic Design, which brought the total made on the night to £180. 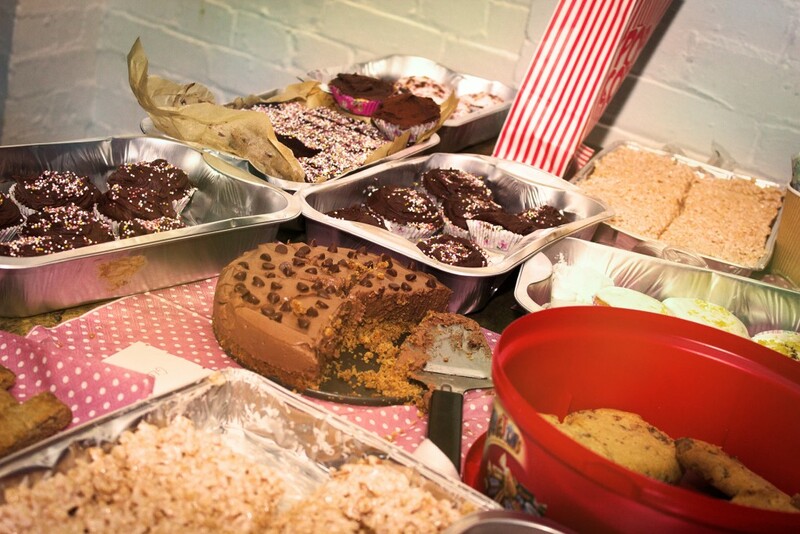 An emergency bake sale was held the day after the quiz night in the Camberwell reception area, which sold the rest of the baked goods making an extra £50! We managed to fund-raise the total amount, which has meant that the degree show team didn’t need to ask any of the students for money towards the catalogue, furniture building materials, or any other supplies. This will be a big weight off our shoulders when it comes down to printing and handing in the final major project. We would like to thank everyone that got involved with the events, as we received a great amount of love from both university students, the general public and local shopkeepers. Also a special thank you goes to the Camberwell Marketing Team for pushing the events across Twitter and Facebook and throughout college.